It’s the heartwarming story of a Welsh commando and his intrepid American sidekick, their girlfriends, and a great deal of dynamite cutting a swath of destruction across the German mountainside and a trail of dead bodies a couple of miles long. Richard Burton shuffles off his Shakespearean coil and dons an SS officer’s uniform to wax poetical about how much he loves Hitler or maybe not or maybe, it’s very confusing. I think at one point he is acting as a quadruple agent. The plot is nevertheless watertight; the acting is terrific; the directing workmanlike; and the stunt work spectacular. It’s one of the greatest WW2 adventures committed to film and my teenage memory, keeps up a breakneck pace (sometimes literally), and it’s so long you can take a nap at a couple of points and not miss any of the ridiculously complicated plot. I wax poetical about the guns, cars, and aircraft, explain who is who, determine if the film passes the Bechdel Test, and generally have a good time, altho I mix up the aerial tramway with an inclined railway and sing a bit of “Funiculi Funicula”, and I may have suggested that Alec Guinness starred in Hitchcok’s Secret Agent when it was in fact John Gielgud. I compare it to Star Wars, Indiana Jones, Inception, The Good, the Bad, and the Ugly, other WW2 movies, Hammer horror, James Bond, Top Secret, buddy cop movies, and The Thing. Bonus: a scorecard, by which you might better know the players. I’m watching and HD version off DVR. Start the film on the countdown between the MGM logo and before the mountains come up. Probably the best film ever made. 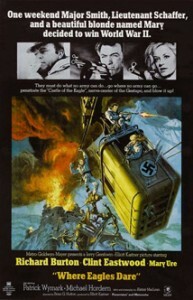 😉 A film from my childhood that had everything from Cable cars to pubs!! Worth watching to see Clint firing two Mp40s at the same time. A boy’s own adventure. A fore runner to modern day action films. Thanks T.
great film and another great show ‘ you should also do the wild geese another great burton film with the added bonus it also stares sir roger moore and richard harris. Great movie and great commentary, as usual. – Very like your clear voice. Doh I forgot to check your website for this. I’ve been getting carried away lisiting to podcasts on 80’s/90’s computer/video games. Just download Eagles and will listen. +1 @Craig comment ‘Eastwood and 2 MP40s’ 🙂 also I agree with @Philip Green – The Wild Geese was a classic film too.